Home canning carrots takes some time but is inexpensive. You will need fresh carrots (from store, market or garden). 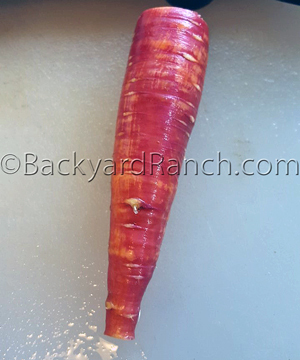 I used heirloom purple carrots from our garden, a large bowl, jars, flats, rings, a small bowl, table knife, jar tongs, regular tongs, a ladle, a large pot, a pressure cooker, a rack to place inside the pressure cooker, a roll of paper towels, a timer and salt. 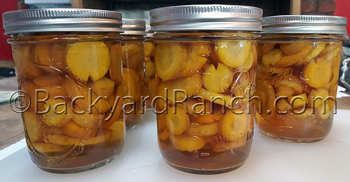 When home canning carrots, jars and flats should be washed and rinsed thoroughly then fill a few at a time with hot or boiling water at least half way to the top of the jar. Jars need to remain hot until they are used. Flats should also be soaking in hot water in a small bowl until they are used. Flats are the flat disc part of the lid of the jar, should never be re-used. Always use new flats. The rings and jars can be used repeatedly. Place the rack, in the canner, the rack should be about half an inch off the bottom of the canner. Fill with enough boiling water so that the water level will be an inch over the top of the lid on the filled jars. The water should be near boiling when the jars of carrots go in the pot. Only prepare as many jars as will fit into your canner at a time. The jars need to stay hot when home canning carrots. Before home canning carrots, you will want to wash them very well. There cannot be any dirt on them. 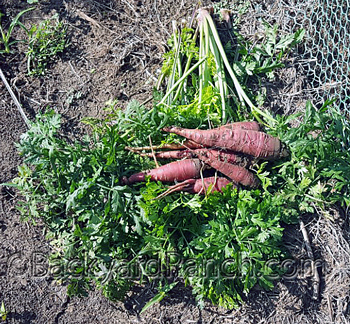 When I pull them from the garden, I snap off the carrot tops and remove most of the dirt before placing them in a clean bucket. 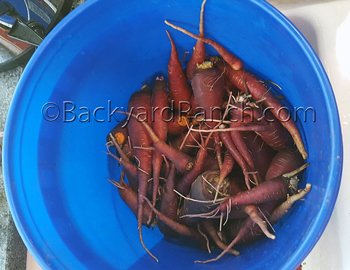 When I finish pulling carrots for canning, I rinse them off with cold water in the bucket to remove as much debris as I can before taking them inside. I use a nylon scruber pad to remove the leftover dirt and debris. Take each carrot, cut off each end and discard the ends (the part you wouldn’t want to eat, the top and the very end of the carrot). Then cut the carrot into the desired sized pieces and place them into the bowl. If you like to eat long whole carrots, then do not cut them down any further than the size that they will fit in the jar. 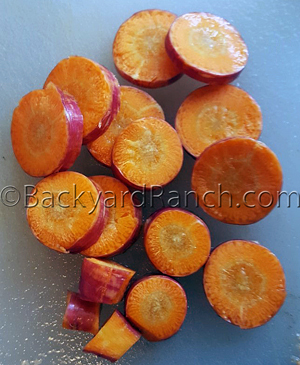 Discard any discolored or damaged carrots, you can remove some damage spots, use your judgment. After all your carrots have been washed and cut up, place them in a pot of boiling water. 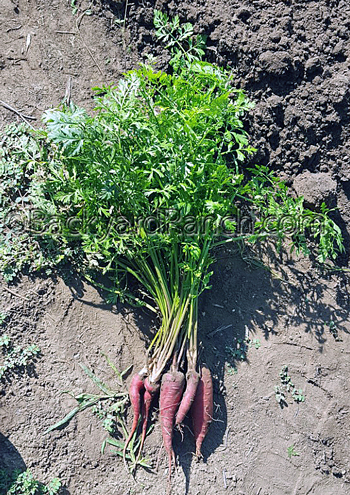 You will need a generous amount of water, make sure to cover the carrots with water. Vegetables like this are hot packed into the jars. Which means the carrots are blanched in boiling water before placing them in the jars. To blanch your rinsed carrots, place them in a pot of water at a rolling boil. Boil them for 3-5 minutes then turn off the burner and remove the pot from the hot burner. Take a hot jar, pour out the water (or pour it into another jar, if it is still hot). Use the ladle and dip ladlefuls of carrots, draining out the water into the hot jar, fill with the blanched carrots up to about an inch and a half from the top of the jar, leaving “head” room in the jar for processing. Put a teaspoon of salt (for a quart jar, a half teaspoon for a pint jar) on top of the carrots in the jar. Salt is your preservative. 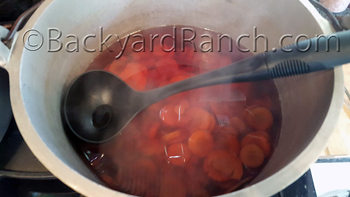 Ladle the juice from the pot with the carrots in it into the hot jar of carrots until the juice covers the top of the carrots. Again, you will want to leave about an inch of space above the carrots and juice in the jar for “head” room. 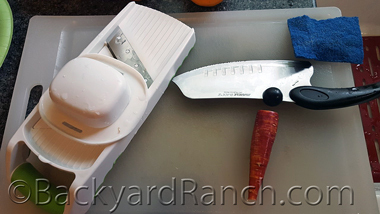 After placing the carrots and juice in the hot jar, run a clean table knife down the inside of the jar along the side, all the way to the bottom, in three places to gently remove any air bubbles that may have been trapped. Wipe the mouth of the jar with a clean paper towel. Use the tongs to remove a flat from the hot water in the small bowl. 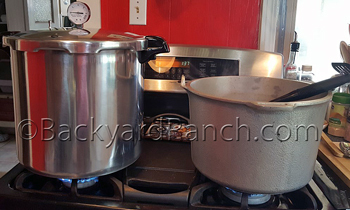 Place the jars on the rack, in the pressure cooker which should already have water at a rolling boil. Make sure that the water is an inch above the tops of the sealed jars. Follow the instructions with your pressure cooker to bring up to pressure before starting your time. This should process or boil for about 25 minutes for quarts – at 11 pounds of pressure. ALWAYS follow the directions that come with your pressure cooker. The time here is approximate. At your time limit, shut off the burner under the pressure cooker and move the pressure cooker off the hot burner. DO NOT remove or loosen the lid. 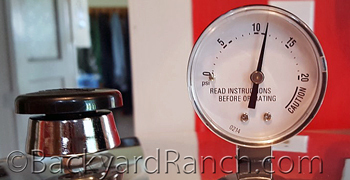 The pressure MUST go down before the lid is loosened or removed. It will take some time for the pressure to go down. If you do not follow this rule, all the juice will be sucked out of your jars and you may be injured by the steam or the jars while removing or loosening the lid. When the pressure is down (follow the instructions with your pressure cooker), remove the jars with the jar tongs (grab them below the ring to prevent warping the ring and loosing your seal) and place them on a dry, heat resistant surface. I use a wooden cutting board. Make sure not to place them on a surface that is covered in water, this will cause the jars to crack and shatter. After completely cooled, the home canned carrots can be labeled – best place to label is on the flat. Always label with the date. The jars can then be moved to a cool, dark, dry place or root cellar until needed. Make sure when you are ready to enjoy your canned carrots, that you empty them into a pot of boiling water, juice and all, to finish cooking. They must boil for at least 10 minutes to insure they were properly preserved and cooked.